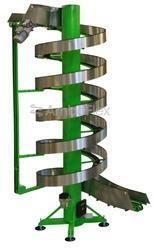 We are leading Manufacturers & Exporters of Vertical Conveyors. Our product range comprises of Vertical Conveyors, Flight Conveyors and Continuous Vertical Reciprocating Conveyor, Conveyorized Platform Lift and many more. Our conveyors are custom designed and fabricated as per the needs of the application and can be customized for dimensions, conveying capacity & loading capacity required according to the material to be conveyed. We have over 30 years of experience in design & manufacturing customized vertical conveyor systems for material transfer. Our ISO 9001:2008 systems certified workshop is fully equiped with fabrication equipments and is located in Noida (Delhi NCR). We are manufacturers and exporters of an extensive assortment of Elevator Conveyors that are used to convey or move various types of industrial materials. Our efficient designs and first class workmanship ensure reliable systems that are low maintenance and have a long functional life. These conveyors provide high angle conveying thereby saving floor space. The conveyors can be customized for mobility to be used for feeding raw materials/components into machines. We have a wide range of belts that are selected to best suit the needs of the application. Handling of Loads 100 kg/unit. Our Continuous Vertical Conveyor is customized to the feed & lifting heights required and the drive elements & structural construction is customized according to the load to be handled. These conveyors can be customized for handling of loads up to 100 kg/unit. 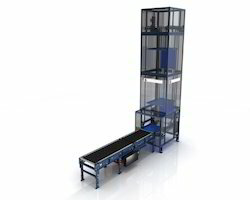 This conveyor consists of multiple platforms that provide a continuous conveying solution between floors. As compared with a goods elevator these conveyors provide continuous conveying thereby saving the time in filling & emptying & waiting times of a goods lift. 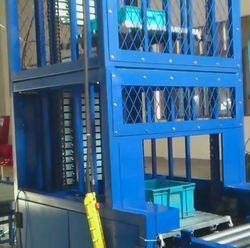 These conveyors can be further integrated with other floor conveyors on different floors to provide a continuous conveying arrangement throughout the factory. We are manufacturer of all type conveyor as per customer requirement, our vertical continuous conveyor uses continuous moving conveyor platforms run on chains for conveying of loads from one floor to another. PLC controlled system with sensors & limit switches for safe operation. 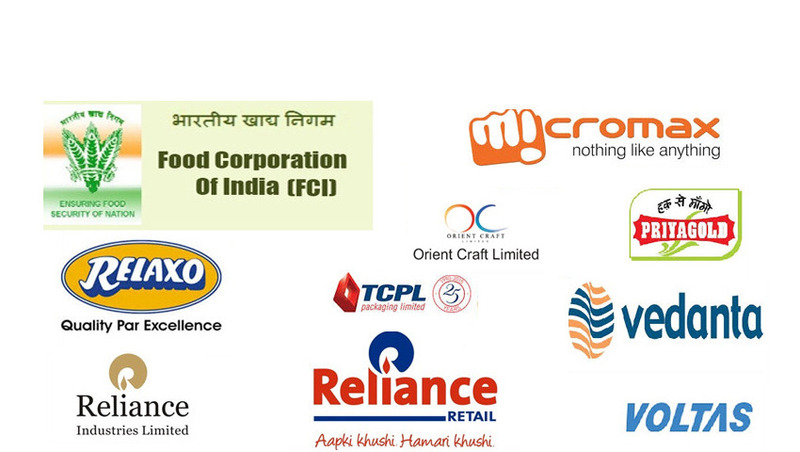 This product is customized as per the space available and required platform size. Please send us your requirements. We manufacture customized flight conveyor for inclined conveying of unit or bulk materials. 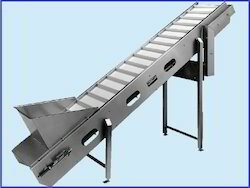 These conveyors can be open type or compeletely enclosed. The conveyor inclination and foot print is customized according to the space available. Special belts such as high grip rough top, cleated belt or chevron belts are used depending on the inclination angle and type of material to be conveyed. For bulk materials drag chain conveyors or screw conveyors are used for continuous incline conveying. These are customized equipments, please send us your requirements for a customized solution. Only one drive needed for heights up to 12 mtrs. Choice of many belt types to suit different applications. Belt maintenance can be done without using tools. Transports heavy items even if not centered.